1.Holding box grater with largest holes facing up, run zucchini along holes to create long strands or zoodles. In large bowl, toss tomatoes, onion, beans, mint, oil, lemon juice, cumin, salt and pepper; fold in avocado and cheese. Makes about 8 cups. 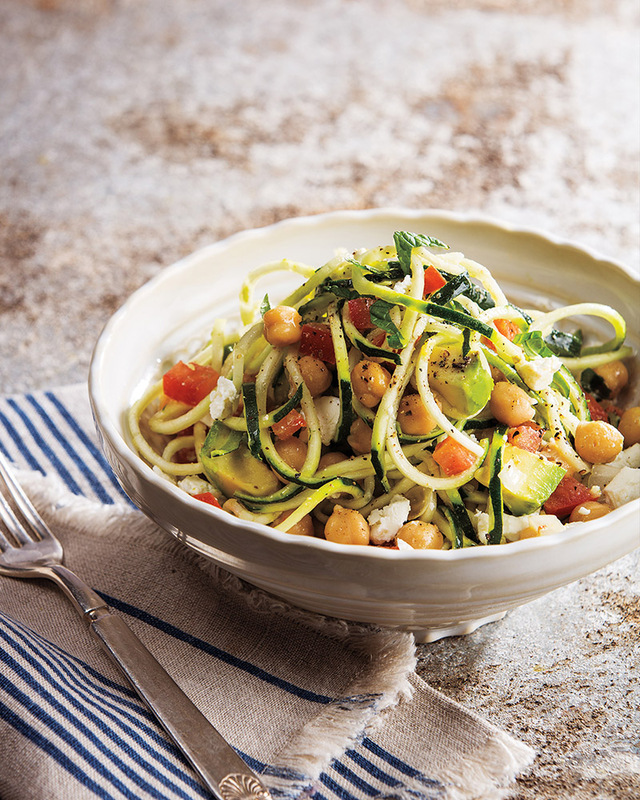 A mandolin-style grater or spiralizing tool can also be used to create the zoodles. If not serving immediately, cover and refrigerate up to 2 hours. Fold in avocado and cheese just before serving. Add minced jalapeño chile pepper or crushed red pepper flakes for a little spice. > An avocado’s color does not always indicate ripeness. Ripe avocados will yield to firm, gentle pressure in the palm of your hand. Purchase a firm, unripe avocado if you are not planning to make this recipe for a few days. Unripe, firm avocados can be purchased up to 5 days prior to an event.